The Guardians of the Universe are a race of immensely powerful blue immortals living on Oa, the planet at the center of the universe, who founded and run the Green Lantern Corps. An immortal race as ancient as life itself, the benevolent Guardians of the Universe desire a peaceful, orderly existence for all living beings, as well the pursuit of their own enigmatic agendas. They never allow emotions to infect their thoughts and actions because after all “emotions bad!” Well, you would think after the War of Light, where the Guardians return to their Citadel, and realise they could never have stopped the War of Light, watching it blaze across the universe. They decide to prepare for it, and are about to execute a Code Zero, when on Ryut, the Black Lantern Central Power Battery spews out billions of black rings. Scar reveals herself at last, seizing one of her fellow Guardians and viciously killing him. Using her powers of the Black, she immobilises the other Guardians before they can act, and reveals that she’s been dead since the Anti-Monitor touched her. She teleports them to Ryut, and shackles them to the Black Battery, telling them that she is only fulfilling their ancient promise to bring order to the universe, and forcing them into a sleep. Upon the Battery coming to 100% power, she warps it, herself, and the Guardians to earth, where Black Hand summons Nekron to rise. Several attempts are made by the Flash, Ganthet and Sayd, the New Guardians, and other heroes to free the Guardians from their imprisonment, but all are unsuccessful. Nekron murders one of them, Black Hand using his gutted innards to summon the Life Entity, which Ganthet explains is the origin of all life. He also explains that the Guardians, upon finding it, realised life first began on earth, despite the Guardians being the first sentient beings, and that they hid the Entity, and the earth, so as to protect the Entity from exploitation. There would be a more focus on maybe starting to ‘feel’ after everything happened in the Blackest Night but noooooo! Back when the scientist known as Krona broke their highest law by constructing a machine capable of looking back into the dawn of creation. Krona had been repeatedly admonished against this heresy but had ignored all warnings in his desire for knowledge and power. As a result of his arrogant disobedience, Krona unleashed an explosion of anti-matter which wiped out billions of years of time and created evil throughout the universe. Krona’s rash act further resulted in the creation of the Anti-Matter universe and the Multiverse, the fracturing of time resulting in countless alternate dimensions. Feeling responsible for their brother’s actions, the Maltusians banished Krona, turning the madman into a being of pure energy sent on a wandering course throughout the cosmos. More seriously, the Maltusians knew that, as it had in the past, the universe would one day contract upon itself to be reborn by a new “big bang”. Due to the anti-matter unleashed by Krona, the universe was deprived of sufficient matter necessary to ignite a new “big bang”. As a result of the actions of one of their own, the universe and all existence would one day simply die out, never to be reborn. The Maltusians decided to dedicate their species to policing the universe. By keeping evil and chaos in check they calculated that they would be able to preserve a sufficient amount of the existing universe to ignite the next “big bang”. Through order and conservation the universe would be saved from extinction. Calling themselves the Guardians of the Universe, a group of Maltusians left Maltus and settled on the planet Oa, located at the center of the universe. The Guardians believed that emotion had clouded Krona’s mind and was at the root of his evil. Emotion, they reasoned, was a fatal flaw of lesser creatures that lacked the vision and foresight of immortals such as the Guardians. While a creature with a lifespan measured in years could afford to act on concepts of love, honor, and duty, the Guardians must measure their actions against the fate of an entire universe over billions of years. Emotion was therefore a luxury they could not tolerate and, if they were to successfully steward the universe, the Guardians would need to forgo emotion all together. Now with Krona collecting all of the Emotional Entities for an unknown purpose. 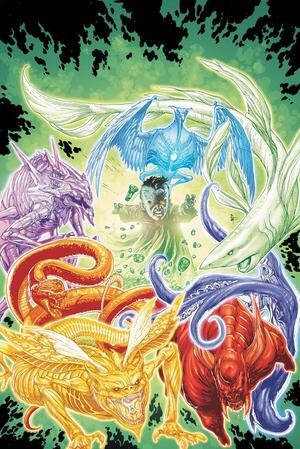 The first act of Krona’s plan occurs with his abduction of the fear entity Parallax during the finale of Blackest Night, imprisoning the creature within the confines of an ancient temple marked with the symbols of the Emotional Spectrum. Krona then proceeds to remove Ion from Sodam Yat, effectively turning Daxam’s sun from yellow back to red and killing hundreds of Daxamites in the process. Over the course of the story arc, Krona is shown working with Hank Henshaw, telling him that enslaving and altering the qualities of the Alpha Lanterns will restore his mortality and also lead to the destruction of the Green Lantern Corps. In addition, he is shown working with the telepathic Zardor in his plot to brainwash rookie members of the Green Lantern Corps for his own purposes. Krona later appears on the Eastern Seaboard of the United States — with an obedient Parallax in tow — to Hal Jordan, Nicole Morrison, Larfleeze, Saint Walker and the Indigo Tribe, seeking to obtain both Adara and Proselyte for his entity collection. When confronting Jordan and the others, Krona reveals that, prior to his banishment by the Guardians, he was the caretaker responsible for protecting the entities, and that is why he can control them and the abilities they possess. 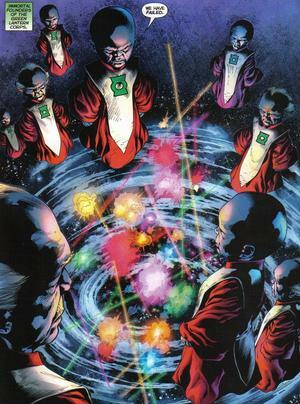 Now the Guardians have once again seen the use of emotions to be far too dangerous to be left unchecked and now they are seeking to get rid of GLC members such as Hal Jordan and putting the other corps at such a far distance to keep Krona from winning, they once again set themselves up for war. What is it going to take for the Guardians to just let people ‘feel’ and they can just let things play out naturally but since they feel having emotions causes too much strife and in their long lives has shown that there is no order or protection with the 7 emotions out there for Krona to manipulate all the other corps with, they just want to kick out those who are causing trouble instead of sitting down and talking with them. Yep, nothing good is coming to come out of this. Great job Guardians, remind us why you are in charge again? You seem to cause all these problems instead of help.